Slf4j (Simple Logging Facade for Java) APIs provides abstraction using facade design pattern for supporting different logging frameworks like Logback, Log4j, Java Logging, etc. Using Slf4j, the software can be independent from the dependency of logging implementation frameworks and it can be configured to use any logging implementation frameworks which it supports. It allows to plugin logging system at deployment time. In this tutorial, we will learn how to setup Slf4j with Logback framework in Spring Boot project. 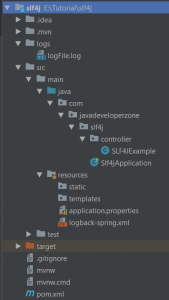 If you are using spring-boot-starter-web artifact in spring boot then you do not need to add any other dependency for Slf4j and Logback. Because, spring-boot-starter-web already contains dependency of spring-boot-starter-logging which contains dependencies of logback and slf4j. Create Controller File where Logging can be performed. Logging can be performed in any Java file but for ease we have taken Controller for different levels of logging test. Main things to notice here is get Logger object by LoggerFactory rather than LogManager of logging implementation. We not directly coupling with logging implementation framework. Here, we are using LoggerFactory of Slf4j API proving loose coupling with implementation. We can configure any java logging framework with project which is supported by Slf4j. Create logback-spring.xml configuration file in the resource folder. Logback can be also configured by logback.groovy. 2). Appender: It appends log to configured appender like console, file, jdbc, etc. Here first we configured Console and File appenders. Here, we have defined two Appenders ConsoleAppender and FileAppender. You can use other appender like RollingFile, DB, SMTP, etc. File path for logfile has been defined in <file>logs/logFile.log</file> tag. level is for Log level like DEBUG, ERROR, etc. logger for logger name – numbers behind that define how much specific classname you needed. For Logger configuration, we can set whole system logging level by <root level="ERROR">. There possible values for logging level are DEBUG, ERROR, TRACE, WARN, ALL, INFO, OFF. For example: If your log level set to INFO then your logging appender will show you INFO, WARN, ERROR types of logs. If you want to set logging level for particular package then you need to define separate loggers and logger for that. We have set ALL logging level for javadeveloperzone.log4j.controller package means that all types of logs will be captured from classes that package. If you set additivity="false" in logger tag, your logs for the configured package will be stored only in logs/logFile.log only, it will not be shown in console. Note: you can change the logging system to log4j2, java logging, etc and you need to change in Java code. You need to just change configuration. Example: If need to add support for log4j2 then you just need to exclude spring-boot-starter-logging from pom file and add log4j2 configuration file. 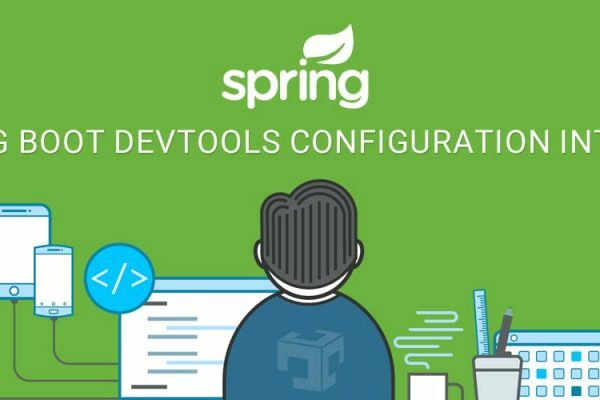 In this article, we learned how to configure Slf4j with Logback in Spring Boot with XML file. Slf4j is a facade layer for providing support for different types of Logging implementation in java. Your code can be written without tight coupling of logging framework.